In my travels to companies working to transition from conventional management to Lean management, I find that visual controls are greatly underutilized. If we’re trying to learn new ways of thinking and doing things, then we need help to remind us to think and do things differently. A lot of visual controls are needed, but not just on the shop or in the office. Leaders need visual controls as well, for both their day-to-day management work and for strategic direction. Leaders, like everyone else, must learn new ways of thinking and doing things. Yet, in most cases, leaders tell people do think Lean and do Lean things, while then proceeding to do the same things they have always done. Visual controls can help avoid this inconsistency. Leaders are not exempt from improvement and should create their own Lean leader visual controls. It is a fun and creative activity to engage in. 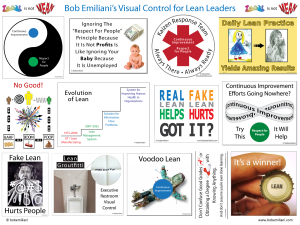 Or, you can use this one page (two-sided) Lean leader visual control that I created. If you don’t like it, try this one instead. Print copies for your self and others. Carry it around with you, post it at your workstation, in conferences rooms, etc., and refer to it every day. For more than a decade, visual controls has been an important part of the university courses that I teach. I require students to create a visual control whose learning objective is to help them apply what they learned in the course. Their visual control is based solely on the reading, lectures, homework assignments, and discussion from the course. This is a critically important step in transferring practical knowledge from the classroom to the workplace. In addition, I give students a visual control that I created which summarizes the most important things that were taught in the course. Students just love it. I normally hand out two other visual controls as well – a pocket card and a pen, both of which are cherished by students. Students laminate the visual control in plastic and tell me years later that they are still using it. How many profs can say they have had that kind of long-lasting positive influence? Click here to view some outstanding examples of visual controls created by my undergraduate and graduate students. You’ll be amazed at the creative ways in which they respond to the challenge of creating visual controls based on what they learned in my courses.